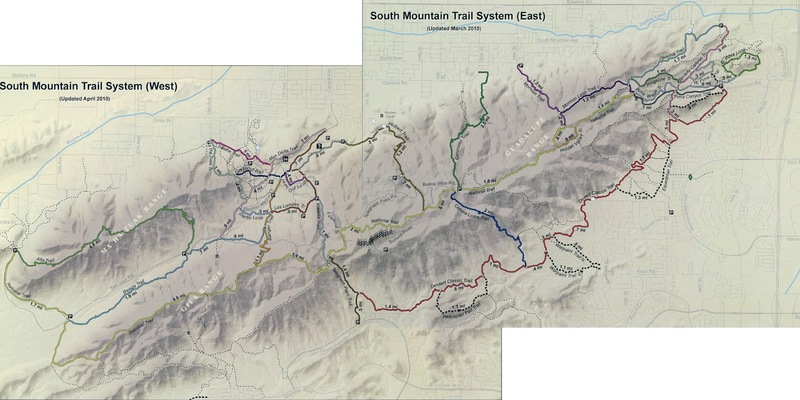 My growing interest in AES events led me to ponder a route through South Mountain Park (SoMo) deemed worthy to be mentioned the likes of Kentucky Camp, Antelope Peak, etc. What I came up with was daunting and would require cooler temps. The weeks and months went by as I piled up miles doing other long rides and before I knew it we were hitting 108º. Welcome summer riding season. Luckily for us here in the Valley of the Sun and cold front blew in on Friday just in time for the Memorial Day weekend. Projected high for Saturday: 82º! With no difinitive ride plans, I made a last minute call to give the SoMo Monstercross a GO. Steve decided to join in the fun, on a single speed, and we met at the trailhead shortly after 5am. Our task for the day would be roughly the following route: Start at the Pima Canyon TH, East Loop, Javelina, Mormon Loop, National, Bajada, Alta, National, jeep road connector, Bursera, Pyramid, National, Ranger, Los Lomitas, Kiwanis, summit road, Upper Holbert, National, Geronimo, Mormon (24th St.), National, Desert Classic out to the Helipad, back on DC adding in the optional loops: Corona de Loma, Warpaint, Secret and the Tour de Backyard, FINISH. This map can be purchased at Global Bikes on two pages for $2 ea. This route would take you up & over S.Mtn. 6 times & be approx. +/-65 miles. My hope was to complete this ride before sunset or 14 hours. Right from the start I didn't feel right, cruising around the East Loop I was waiting for my legs to wake up! We started climbing Javelina and it was a real effort even in my lowest middle ring gear. I stopped at one of the tech moves and my hands were shaking a bit, kind of had the hunger chills and knew this was not good. I made my way to the top of the climb and sat down for 5-10 minutes, not even 5 miles in and I was bonking!! I ate my normal pre-ride breakfast, had a decent nights sleep, what gives? I started to feel a bit better, so we pushed on. Up Mormon Loop, up National - watched a few guys busting some nice tech moves above the waterfall. Kelstr cleaning a tough move. Looking down the Waterfall. Phoenix waterfalls have rocks, not water! We crested National, made our way towards the TV towers to the fun descent. I had my best run on that stretch of trail thanks to my big ol 29er wheels, cleaned everything down to the first super tight switchback above Telegraph Pass. I was feeling better, but still no real power in my legs. We were near the top of the HAB section following Telegraph when Bob met up with us. He lives close, wanted to do the ride with us but time constraints kept him to a shorter route. We tried to keep up with him to no avail. Each time I looked up Bob & Steve were getting smaller and smaller as they pulled away from me. We left Bob at the Bursera turnoff as we continued on down National towards Bajada. View of west National from the Bursera split, Estrella Mtns. in the background. This was my view of Bob for the miles we tried to keep up, he's FAST! Steve sprung a Stan's leak on the final descent of National, tube time!! This pitstop gave me a chance to snack! We arrived at the Bajada junction and immediately the trail deteriorated into a loose 5" layer of rocks. It had the sensation of riding on 3 layers of golf balls!! The only tracks on this trail were hoof prints from the horses that frequent the park. Add in a lack of rainfall and this was going to be ugly. Bajada on a good day is a challenge as it is technical and drops in/out of washes on not-so bike friendly contours. Now, add in the loose conditions and the onset of round two of bonking and I was having serious doubts about completing this ride. I plodded on, walking a ton, and getting more frustrated at my lack of bike skills on this day. Alta trail was looming large in front of us and I was having issues just trying to HAB. I caught up with Steve at the Alta split and called my day done. 19 miles of dirt, weak. Off to the road we went, threw in a slight detour on the Max Delta Trail on our way out of the park. Then it was a mix of neighborhood roads to a canal path that eventually brought us back to Pima Canyon. Ended up with 30 miles total, but felt like it was almost a wasted effort. I'll be back to try this beast again, probably in November & with lights. We were very fortunate to be only a few hours drive south of the annular eclipse path, so we loaded the car for a long day trip north towards Page, AZ. Our initial plans called for us to do some exploratory hiking in the slot canyons of the area, but K's feet have been acting up & there were permit issues. On to plan B. Neither of us had been to the north rim of the Grand Canyon and it wasn't too much farther along. The north rim is typically open from May - October due to snow & low numbers of visitors. Luckily for us the rim road, route 67, had just opened for the season the Monday prior. Over the years I've probably made it to the south rim about 20 times, never disappoints, but the crowds can be a detractor. Welcome to the north rim, where visitors are measured in hundreds instead of thousands. Before hitting Jacob Lake and the Canyon turnoff we stopped to stretch our legs at the Navajo Bridge that spans the Colorado River. What a sight! We spotted a dozen rafters beginning their journey down the mighty Colorado. We were then treated to the sight of 4 California Condors! Truly magnificent creatures. Twin spans, one for vehicles one for people. One condor coming in for a landing. After the bridge we made our trek past the Vermillion Cliffs and up into the Kaibab Nat'l Forest. It still amazes me how fast the landscape can change in Arizona. The drive south down route 67 was really nice, wide open meadows encircled by tall pine trees. Great sundeck at the Grand Canyon Lodge. This would become our new farorite view of the canyon. Lots of green in the canyon. Some of the side canyons. Colorado River through Angel's Window. Humphrey's Peak near Flagstaff, still a trace of snow up high. Shadows begin to cast over Cape Royal. We weren't the only ones up north for the solar show. We left the canyon a bit later than we would have liked, but we were enjoying the views! Our new goal was to get out of the Kaibab and back down to the Vermillion Cliffs to watch the eclipse. We found a nice pullout with a historical marker on a long stretch of road - perfect! We settled in as the eclipse began. Keep in mind this was my first attempt at photographing the sun. We would soon be parked down below the Vermillion Cliffs on the far right of the frame. Faint sunspots can be seen on this one. Long stretch of high desert..
All in all I am very pleased with the results. Homemade solar filter was a success! It had been a long time since we did a road trip, perhaps next time we'll stretch that 826 miles over a few days!! Stopped by the Lee's Ferry turnoff, hopefully one day soon I'll have a good reason to drive down to the river. A co-worker of mine, Rob, has set a bucket list task of sorts. He is aiming to travel the entire Arizona Trail before he turns 50, that gives him a little over 2 years to accomplish the feat via foot, bike and/or horseback. He is setting out to do one passage per month to reach the goal and this month was adventure no.3. He wanted to mountain bike a northern easier passage and settled on passage 35: Babbitt Ranch. This passage is mostly forest/jeep roads with little elevation change in a remote stretch of northern AZ between Flagstaff and the Grand Canyon. I decided to join Rob, his wife, Monica and friend, Mark for the trip. We all piled into the 4runner and went north. I asked Rob if they wouldn't mind dropping me off a bit early so I could get in some bonus miles. They obliged and dropped me at the split of FR151 & 418 on the flanks of the San Francisco Peaks. By doing so, I was going to do a short bit of climbing up to the Bismark Lake trailhead then join the AZT at 8900'. From there I would head north and downhill for almost all of the next 25 miles to the beginning of Babbitt Ranch, this would also complete passage 34 for me. Rob, Monica and Mark bidding me farewell for a few hours. A nice climb up FR151 for a warmup. Thanks to my bud, Harry, for letting me borrow his Niner on this one. A few lingering snowfields high up. Some of the best singletrack around. I didn't want to stop on this stretch. White Horse Hills in the foreground. A bunch more singletrack than I anticipated, sweet! The singletrack eventually dumped me out on a heavily washboarded forest road. The whole time down this road I was wishing for more sweet singletrack! My Garmin kept beeping at me 'Off course....course found....off course....course found....' I kept glancing down at it, thinking, 'I'm on course, I'm right on top of the line!!' I finally did go off course, the forest road kind of lulled me to sleep as the trail veered off to the left, so I backtracked to a gate and found more singletrack!! I was getting back on my bike when I saw there was a trail coming in from the left....huh? AZT? I decided to ride back up the trail to see if I missed the cut-in from the forest road, nope. Apparently the AZT parallels the washboarded road very closely & I missed the entrance a couple miles back. Good to know for next time! Getting set to drop down a saddle into open range land. Looking back at the saddle & San Francisco Peaks. Snack break & the beginning of Babbitt Ranch. Lots of fast open riding here. One of the few signs of civilization out here. Caught up with Rob & Mark on this open windy stretch of 'trail'. It took about 2 1/2 hours to reach the start of Babbitt Ranch, about 25 miles, so I figured I wouldn't see Rob & Mark for quite some time. I guessed that they had about a 2 hour head start, so I was really surprised to see them after only 8+ miles of the passage. Come to find out, they missed a vague turnoff and did some bonus miles as well - 4 down then 4 back up!! Monica just so happened to be driving in from the other direction when I caught up to them, so it was a good spot for lunch. Rob was getting a bit tired and there were still 16 miles to go, so Monica stayed with him as he rotated between riding & hiking along the trail. Mark and I made quick work of the next 8 miles or so. Lots of this along Babbitt Ranch. We stopped for a quick break and Monica drove up behind us surprised at how far we were. She gave us an update on how Rob was doing and we rode on. We were cruising along down a slightly rutted jeep trail riding the high center when my front tire slipped off the powdery dirt to the right & my back tire to the left. I went down quickly driving my right knee rather forcibly into the ground. Ouch, that one hurt. At least I had a ton of water still on me, cleaned out the wound & cracked open my first aid kit. Always pays to be prepared. I've been learning a few hard lessons recently! Finish line only 5.2 miles away. Mark does a bit of road cycling and was riding strong, we'd yoyo a bit then he'd eventually pull away from me, stop for a minute for me to catch up then we'd be off again. We joked how after going through a gate that the wooden signs posted didn't have anything on them. Shortly afterwards, my Garmin was beeping again 'off course'. We missed a turn back at the gate. I tried to catch Mark, but I was getting a bit tired and that wasn't happening so I yelled out a few times, but he kept hammering. I knew both the road & the rare singletrack led to the finish/meeting spot, so I turned around to look for some trail. This is the trail??? Sure is. It was nice to be off the jeep roads and back on trail cruising the trees. The trail meanders along often skirting around deadfall, but is very rideable. I rode on for about 3.5 miles then crossed the FR that I last saw Mark on. The trail continued across the road for the final 1.5 miles to the end of the passage. I was expecting the passage to end with the trail dumping me out onto the FR, but instead the terminus is a 4-way trail intersection in a meadow. The 4runner won't be picking me up here! There was a sign posted that indicated the Moqui Stage Station was 0.25 miles to the left and I knew the road was that direction. Only 1 set of tracks out here. The end of Babbitt Ranch looking back to the south. Small stock tank on the spur trail out. I made it out to the sign above around 4pm, roughly 7 hours for my 50 miles, not bad for me. I sat and waited, hoping to see Mark come by or the 4runner drive up the road. Nothing. 4:30, still nothing. About 4:45 I began to get a bit antsy, wondering where each of our parties were. I knew I was at the pickup spot, but did Mark keep going on the road & get lost? Did he turn around & find the faint singletrack (after 45 minutes I figured he didn't because he would have been done by then) or did he ride back until finding the 4runner? How and where was Rob? At 5p I took inventory of my things, jacket, arm warmers, water, food, all good. Am I going to be stuck out here for the night? hmmm. I also knew I was too far out to ride out before nightfall & my cell phone had no signal - nice. I decided it was best to ride back on the road for a couple miles to see if I ran into anyone, they HAD to come this way, right? After 2 1/2 miles I spotted the 4runner heading my way, Rob's bike on the back and Mark inside as well - whew! Where's Rob? He was still hiking, now a couple miles into the singletrack section, but at last report he was hurting pretty bad. Shortly after packing up my things and rearranging the truck, we received a text 'I'm out at the road, come pick me up'. Rob was done. Time to head back to pavement. Came across the fast moving pack of pronghorn on the drive out - 32mph!! See, Arizona isn't all rocks & cacti. An hour and a half of criss-crossing jeep roads we finally popped out onto route 180. We headed to Flagstaff for a cold brew at the Beaver St. Brewery then onward to Phoenix. It was a long day, but a fun one. I was really captivated by the openness of the land up there. The roads were smooth enough to enjoy your surroundings most of the day. I'll do this route again soon with the intention of riding all the way to the south rim of the Grand Canyon. Perhaps as a 2-day bikepacking trip. Thanks Rob for letting me in on your bucket list adventure, just don't forget those last 3 miles when you do passage 36!! Both include full returns on a series of forest roads, slightly modified each year.